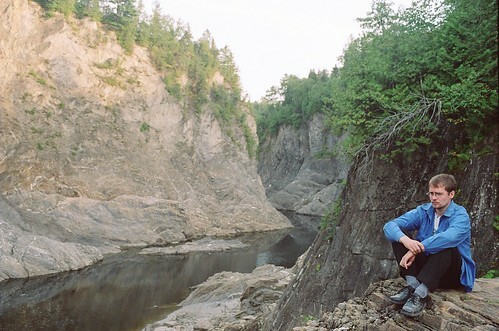 This is my new haircut and Hey Rosetta! Shirt. 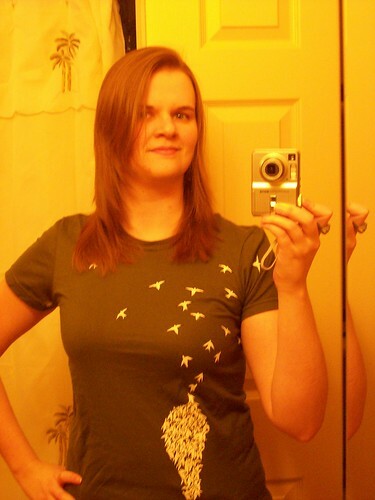 The birdies fly over the shoulder and onto the back of the shirt where it says "hey rosetta!" I had promised Sherrie a picture of my haircut about three weeks ago (though, my haircuts really all look the same to the untrained eye), so it's about time I put one up. The shirt is an army green. All my indoor photos are yellow tinged, because it hides the fact that I never bother wearing makeup anymore, also, my flash is so bright that I'd have to wear stage-makeup in order to look good in a photo. In other news, the job is going well. I'm finally getting used to it. This past month I only worked part-time hours, but that should change now that I know what I'm doing. I don't mind the job so much, it's kind of nice. This is either a phase, and I will go back to freaking out about where my life is headed soon, or I've actually managed to get it through my head that this doesn't have to be the be-all-end-all of my life, and I might as well enjoy it while I can and keep thinking of future possibilities. Right now though, this job is a pretty sweet deal and I'm happy with it. ...Gabe is officially returning to China. He's not particularly thrilled about it. The good old Canadian gov't once again turned him down for a job and so, feeling useless and unwanted by his own country, Gabe decided to go where he knew he would be welcomed: China. So, he is going back to teach and practice his Mandarin more, in the hopes of being able to eventually become a certified translator/interpreter. I promised when he came back the last time, that if he ever returned, I would go out and visit him. It's not often you get your own personal guide/interpretor in China, and I figured I should take advantage. So, there you go. That's what I've been up to the past month. I know this is a news post and originally this was supposed to be a writing/photography journal, but whatever, now it's a catch-all. I did find a story I wrote when I was eight or nine, that I think has a very good moral...so I might post that this week sometime. In the meantime, enjoy THIS ARTICLE about why I'm right and the rest of the world is stupid.